He is a guest from another dimension and lives only on chewing gum. Gyro says about him: He has the capability to change the molecular compound of chewing gum so that it assumes every desired form . He helps the Ducks and Superduck sometimes. His debut was in Italian I 1707-A (August 1988) written and drawn by Giulio Chierchini. There he first fights against Superduck but at the end of the story they work together against the Beagle Boys and become friends. Often a special kind of colouring sometimes described as electronic is used for his stories. 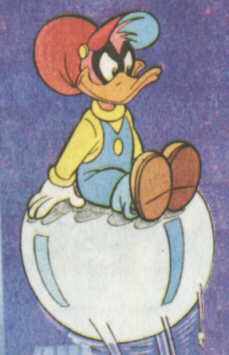 Although it's in English, Little Gum is actually his original name in the Italian comics. Information from Alexander Grünke and Marco Barlotti. Last updated July 26, 1997.